In this interview, Stuart Lonsdale talks about Gouda pottery, focusing especially on the designs and the artists’ markings. Based in England, Stuart can be contacted via his website, Gouda Design, which is a member of our Hall of Fame. I think it all started with a small pottery vase my mother obtained from the art pottery shop where she worked in the early 1920s and ‘30s. After she died in 1988, I didn’t initially didn’t take much notice of the vase, but then one day I just happened to look underneath and wondered what all the marks meant. I started trying to research it, but it was very difficult because we didn’t have the Internet then. I came across a book by Phyllis Ritvo, The World of Gouda Pottery, and it started from there. Then we got a computer and started to investigate on the Internet. We started the website, and since then it’s just snowballed. We started getting e-mails from collectors in Holland who were amazed to find that someone in England was writing about Gouda. We’ve made lots of really good Dutch friends who we go visit two or three times a year. And it all started from this very small vase. 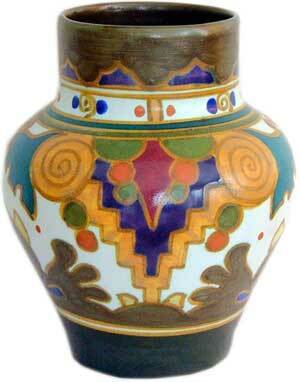 I was attracted to the vase because there were so many different colors on such a small piece. The colors weren’t complimentary and it had a black background. I hadn’t seen anything like that before. I wasn’t interested in pottery; my only interest was the fact that the vase was in the house. It just went from there. It’s difficult to say why. Collectors Weekly: Can you tell us a bit about the history of Gouda pottery? Lonsdale: There isn’t a factory called Gouda pottery; the pottery is called that because the main factories were in Gouda. Gouda (pronounced ‘how-da’) is the generic term we use for all the pottery factories in Holland – all Dutch pottery other than Delftware, that is. The area around Gouda had clay to make pots, which is why most of the factories settled there. A lot of the clay also came from England. The Dutch started producing clay pipes about 1740, and some of the factories that produced clay pipes turned to making pottery because there was demand. They didn’t do it for love; they did it for profit. People wanted pottery for their home. This style of pottery was pioneered in about 1898 by a company called Plateelbakkerij Zuid-Holland, or PZH, but they didn’t produce the type of pottery that you see on our website. That wasn’t made until about 1910 when they discovered a new process to produce matte glazed pottery. It was known as the Rhodian process, which is actually the name of one of the most popular decors. It was known as matte glazed pottery. Collectors Weekly: What characterizes the Gouda pottery that you have showcased on your website? Lonsdale: The flowery and curvaceous designs. Whereas Holland started with Art Nouveau. 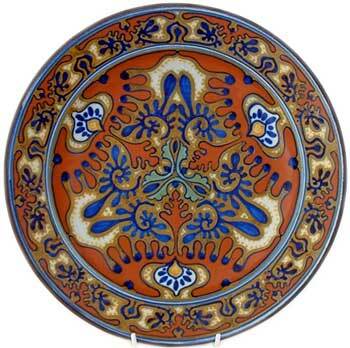 Mainly you concentrate on the matte glaze, which for us is the mixture of abstract and floral designs. You can mix the two together and it makes a lot of bright colors. The use of bright colors and the mixture of floral, abstract, and geometric designs all on the same piece is a lot more attractive to us. Collectors Weekly: Was there a strong differentiation between the Art Nouveau movement and Art Deco in terms of Gouda designs? Lonsdale: Not necessarily between the periods… the designs, shapes, forms, and patterns blend together. Holland also produced simple abstract designs which are definitely Art Deco, not Art Nouveau. Whichever design you like, that is the most attractive part of it. They produced abstract floral – not just the Art Nouveau floral, but abstract floral, which sounds a bit silly. It wasn’t floral and it wasn’t abstract; it was a mixture of both. Of course, they also produced a lot of geometric designs, which a lot of Art Deco pottery did. Collectors Weekly: Were there any particularly influential designers or pottery schools? Lonsdale: I’d have to say just the Amsterdam school. There were quite a lot of designers who worked for other factories and moved to Zuid-Holland when the PZH factories started. A lot of really good designers started working for PZH and carried on the designs from the Art Nouveau period into the Art Deco period. That’s what attracted us to them – the mixture of abstract forms with floral forms, which were highly unusual. No other pottery factory has done that. It’s not just one form; it’s a mixture of all different forms. I think what most people find attractive is the mixture of different bright colors. Gouda pottery was exported by the millions all over the world. You name a country and it was exported to it; all over England, America, South Africa, Australia, New Zealand. Millions of pieces were exported – vases, plates, you name it. They’re not hand-thrown, they’re all molded from liquid clay, but every one is hand-painted. That’s why there were so many different artists that worked for all the different factories. They’re signed on the bottom, mostly by the person that painted them. It’s not really their signature in full but their initials, because when they were making them, they had to know which particular person made which pot. They were paid by the number of pots they produced, so the initial was used by the factories to determine how many pieces were made. We collect all sorts, all designers, all painters, all years, from 1900 up to the 1950s and the 1960s. We collect everything. Collectors Weekly: Was Gouda made in sets? Lonsdale: Yes, there were some sets. There were lots of tea sets. There were smoking sets. There were drinking sets with trays and cups. There were individual pieces with pairs of vases. You can think of anything and it was made. A lot have survived in sets, but mainly you will find individual pieces, because sets tend to get broken up. One piece tends to get broken. You can still find sets, but most pieces you’ll find were part of a set or produced individually. Collectors Weekly: Was there a certain period of time when people really started to get interested in collecting Gouda pottery? Lonsdale: I don’t know when people started collecting Gouda pottery. We have some friends in Holland who’ve been collecting it for many years, a lot longer than we have. If I would guess when people first started collecting, it would be mainly after World War II. You have to remember, pottery wasn’t made for collecting; it was made to be used. It would have been found in a lot of homes in Holland, and the people who owned it wouldn’t have thought twice about it. For them, it was everyday household pottery that just happened to be bright and colorful. After World War II when the factories started to close is probably when people started to take an interest in it. I suppose you could say the heyday of Gouda pottery ended in the mid-1930s with the recession, which was all over the world. After that, a lot of the factories, not just Gouda factories but factories all around the world, just simply didn’t recover. During World War II, when the Germans invaded Holland, they took over the Zuid-Holland factory, and the employees were forced to make pottery for the German market. There were still some pieces made, but mainly they were forced to make pottery for the domestic German market. Collectors Weekly: Are there certain Gouda pottery items that are particularly sought after? Lonsdale: We never use the word “rare.” I don’t think there’s such a thing.” Names such as Chris van de Hoef are highly sought after by collectors, and some of their pieces can command very high prices. Most people start collecting Gouda pottery because they like the look of it. They probably even didn’t know what it was when they started out. Maybe they looked at a piece, thought it was nice, turned it over and saw it said “Gouda” on the underneath. We get that in e-mails. People say, “We went to an antique shop and we picked up this piece because we liked it. Then we discovered that it was Gouda, and we went on the Internet and typed in the word ‘Gouda,’ and it brought us to your website.” They send us a picture and they want to know more about it. When we tell them information about it, they say “Well, perhaps we should collect some more.” It’s so colorful; it’s so bright. It does stand out. Like I said, pottery wasn’t made for people to collect; it was made for people to buy. If the Arts and Crafts movement was what people liked, then that’s what the pottery factories would make. It’s the same reason why the pottery factory declined after the war: people’s tastes changed, so the factories had to start making items that people wanted. The trouble was that there were lots of other countries that started making it a lot cheaper. Collectors Weekly: You have pages from other collectors on your website. How did you start doing that? Lonsdale: They just contacted us by email and said, “We have a collection. Would you like to put it on the website?” So we did. I think most people collect like we do, which is a varied selection, not necessarily themed. Mostly what I can see on our website are the very varied collections. 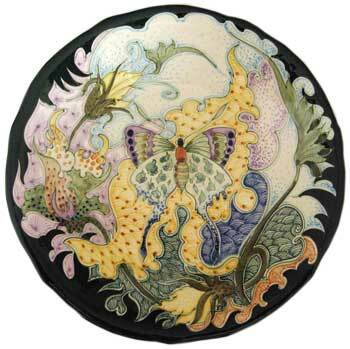 We have lots of wall plates, lots of vases, lots of figurines. We also have a lot which will never be on the website because it’s a private collection. Collectors Weekly: Tell us a little bit about the figurines. Lonsdale: In Dutch it’s “plastiek,” which means “figurine.” We have quite a lot of figurines in our collection, mainly the plain cream ones or plain white ones. They were not necessarily for use in the home; they were more decorative. Think of a shape and that’s it; all types of shapes, not necessarily one particular one. Animals are very popular. Shapes of people are very popular. Naked ladies are very popular. Figurines of all sorts are quite collectible, particularly by the designer Chris van de Hoef. His figurines are very collectible, mainly from the 1920s and 1930s. I think the figurines were all sold individually, although there may have been a theme. We particularly like bears and elephants. We have quite a few in the collection. Collectors Weekly: What are the best places to look for Gouda pottery? Lonsdale: Nowadays, you can find it on eBay, but we don’t tend to buy off eBay anymore. We tend to buy mainly from antique shops and antique fairs or on our travels to Holland. Our friends will often buy pieces for us or tell us of pieces available in Holland that we buy when we visit. There are no Gouda collectors clubs. A lot of our friends in Holland do get together and travel to collectors’ fairs, but they don’t actually sit down and discuss the pottery. Occasionally the museum in Gouda has an appraisal where people can bring in their pieces of Gouda pottery and the collectors give information on them, but they don’t do that on a regular basis. Thanks for the reference to Hongan Ware on your site. Do you have any other resources I could try for more info. Thanks agin. Hazel. Arnhemsche Fayancefabriek was founded in Arnhem in 1910 until 1934. The Rooster mark was in use on items between circa 1920 until circa 1933. To give a more precise date I would need to see the style of the marks. The style of the Rooster did vary according to the date. The Rooster and just the word Arnhem with no other words would indicate a date circa 1910 to circa 1920. I would need to see the marks to tell you the painter – if known. Also the decor name – if known. There were a couple of painters who used a Z style in their mark. Without a picture I cannot tell you which one it was. Deciphering painters marks can sometimes be a real nightmare! The number refers to the model/shape. Please send me a good quality picture to deco@goudadesign.co.uk. Please ensure the subject line contains the word Gouda. If not it may be deleted as spam. Don. Sorry I have no other information to give you. I was once in touch with a collector, David in Ontario, Canada, but lost touch many years ago. Our Dutch friends have no more information. It’s a case of searching the internet and one may be lucky. If you find any information let me know! Stuart. Vera. Your jardinière was made by Plateelbakkerij Zuid-Holland (PZH). The decor name is Zomer. It is a very commonly seen decor and was mass produced between 1917 and circa 1930. If you go to our website Gouda-Design and put Zomer in the search box you will see some examples. Without a picture I obviously cannot tell you the exact date. My husband inherited a Gouda vase from his parents. It was the first gift his grandfather presented to his grandmother. Anyway, I’ve always wondered about this piece because it is beautiful. Its rather tall, with 2 handles. The bottom is a dark, cobalt blue in color and grows to a green and beige color and looks like a sunflower with a leafy vine. I cannot find any information about where it was made or who the designer is. It is inscribed with a Y S Z, Zuid-Holland, Gouda. Can you tell me more about this piece? Thank you! Lee. Thanks for asking a question. I can tell you that your vase was made in Gouda by Plateelbakkerij Zuid-Holland (PZH). As for more information I really do have to see a picture! There are many decors as you describe with the same colours and floral design, including lots with stylized sunflowers – they were a popular subject. 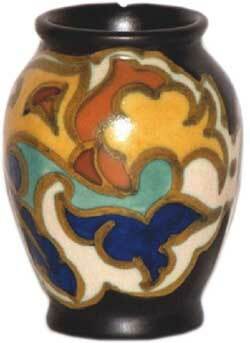 Please send me an email with good quality pictures of the vase and backstamp to deco@goudadesign.co.uk. Please ensure the subject line contains the word ‘Gouda’. My Husband and I inherited two Zuid.Holland Gouda Vases from his parents, they have been in the house for about 70 years; by pure accident, and while we were packing we find out. I made my research and read your interview with Collectors Weekly, and all your information about Gouda. Brief the First Vase is about 102 cm composed of 4 pieces, the upper bowl is removable while the three others are connected with an ax from the bowl’s base to the lower stand. On the reverse side of the bowl written: 121 N.P. after a house then below Zuid.Holland. The second Vase composed of three pieces about 100 cm related to each other with an internal ax ,we wouldn’t remove the bowl to avoid broken it. so we cannot tell u what prescription is under the bowl, but on the reverse side of the base : Zuid.Holland then a House then 139 Gouda H.
we will be much grateful to you if you kindly furnish us, if possible, with : production Date and by whom was made, because they really beautiful. Awaiting your reply to send you photos. Thank you so much for you precious help. I have a small shallow octagon shaped piece of pottery with a little teacup style handle. It was made by Goedewaggen and looks to be hand embossed with the number 951. As well it has been hand painted with the number 620 and capital letters IRAK. Inside the cup is a hand painted bird with foliage. I am curious to know how old the item may be and if it carries any follow. Your thoughts and insight would be very much appreciated. Hello Sue. Thanks for your question. This was made in Gouda by Plateelbakkerij Flora. Founded in 1945 and taken over by Koninklijke Goedewaagen in 1993. Flora used many decors with purple and yellow flowers. Some had names others did not. From your description it could be decor ‘Sylvia’. Date would be between circa 1959 – 1967. Flora did not use date codes. All were mass produced. If you send a picture I may be able to tell you the decor. Send it to deco@goudadesign.co.uk and ensure the subject line has the word ‘Gouda’ or it may be deleted as spam. Stuart. I inherited my gouda vase from my brother inlaw, it’s 81/2 ” tall, has the number 976, Woerden, with a tree and the # 1 under the tree and beside the tree is a house/windmill with initials A.V.W. and last followed by Gouda, Holland. It has a two cracks in the lower portion of the handle that has been repaired. Could you tell me anything about this vase, such as age, value and should I get it repaired by an expert? Louise. An email has been sent to your email address. Stuart. Sharon. An email has been sent to your email address. Stuart. Donna. An email has been sent to your email address. Stuart. Please note. As from October 15 we will no longer be able answer questions. Please don’t post them as we will not reply. This is due to personal and business reasons. We want to thank everyone who has submitted comments. You can find lots of information at our website Gouda-Design. Stuart & Kim. I just found a beutiful floral ashtray with 2860 Royal zuid holland Gouda on the back that I am trying to find more information on. It has a red flower in the middle with leaves and yellow outline. It looks like it has the word Areo RV with a little house symbol. Any information would be appreciated. I have inherited 2 identical items ( 21cms tall) bulbous vases. Beautiful! Base marks read from the top the no 800 then below the name RHODIAN then below that a small diamond and alongside that a windmill and then a small shape like the letter f. the bottom line reads HOLLAND. Also on the base is imprinted a large mark – on one vase similar to the letter P, but with a tail, and on the other similar to the letter T. Any information would be appreciated. Thank you. My Dutch wife inherited a small (10cm high) twin handled vase with gently flared neck and deep yellow / gold lava flow border. The body of the vase is decorated with flowers in muted yellow / orange / purple flowers and foliage. The handles and inner surface of the vase are vivid blue in colour. The bottom of the vase is decorated in the same colour as handles in the style of the lava rim but upside down. The underside is marked VEA KPZ HOLLAND with a central TILTED HOUSE and the numbers 3409 and 2297 at the top and bottom respectively. The initials right centre possibly read WG and the symbol centre left looks similar to an anchor (?). Any assistance you could provide with age and history of this piece would be greatly appreciated. I have a jug 6″ high, cream coloured with flower and bird decoration on crackle glaze. Holland. There seems to be an x on the ml too. I have a small bowl that says “Regina” on the first line, then on the second line it says “Gouoda:Holland”, under that it says “210” and under that it says “Rosario” so no initials. Just wondering if it’s rare or quite common. It is beautiful regardless. I have a vase that is typical hand-painted flowery Gouda-style. It has quite a bit of crazing and the bottom is signed IVORA HOLLAND 105 Delft and something that looks like OBO or 180. Also has an etched 105 on the base. I would think this would be Ivor a gouda, although there is nothing to say Gouda on it. Is this common? “ ” It was that damn Red Baron that pushed the button.